Published on Thursday, April 16, 2015. 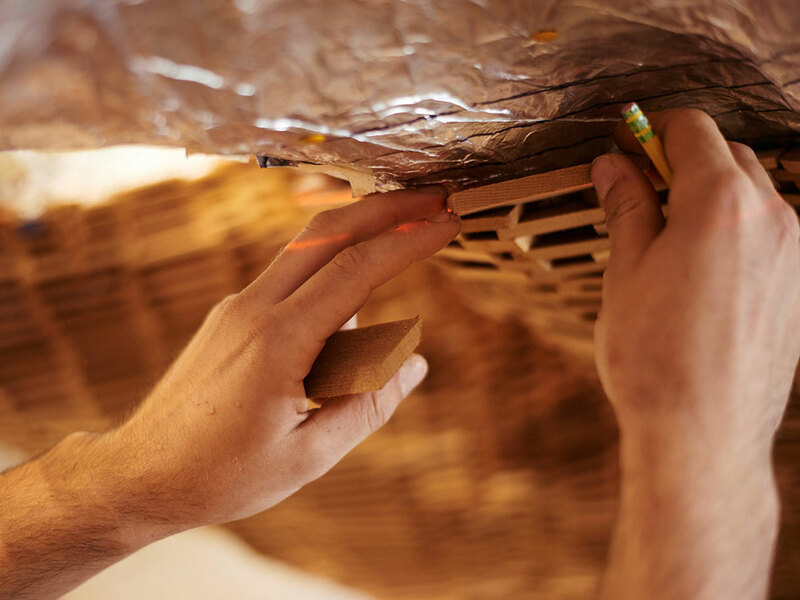 Hundreds of volunteers helped build John Grade’s latest work, Middle Fork, from a mold based on the body of a living 140-year-old hemlock tree. Its shape is something we’re all familiar with, but its presentation – suspended, and on its side – gives the viewer a wholly new perspective on a timeless form. 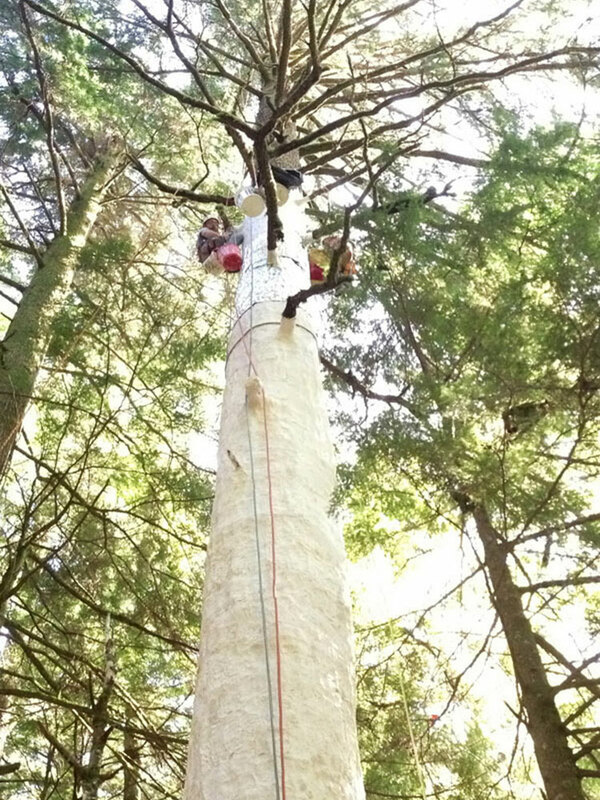 Middle Fork will be on display at MadArt through May 8 before moving on to other locations around the country – eventually returning to the base of the tree from which it was cast. 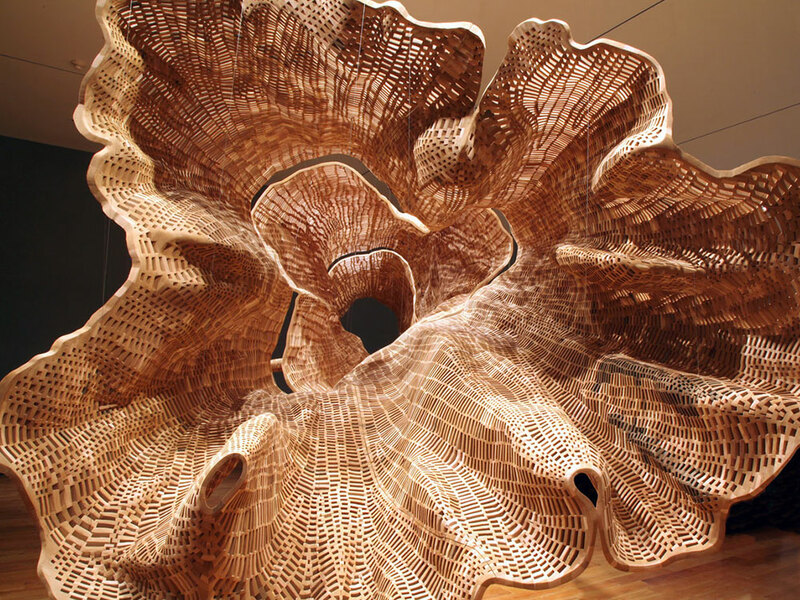 In the spirit of our outdoors issue (April/May 2015), John Grade answered five questions about his latest piece. You’ve described Middle Fork as “an ode to a year in the life of a tree.” Tell us about the evolution of this idea. I have an interest in skins. In 2007, I took a rubber cast of my skin, my whole body, and stretched it into an 8-foot-wide cylinder. Then I built a wood and resin sculpture around the form. The sculpture (Fold) has been buried in a high desert forest for five years where termites are gradually tunneling through the wood. I will dig it up in another 10 years to see what has become of it. I started thinking about making a skin of a tree after that project. With Middle Fork, I chose the thickness of the wood (its individual parts as well as its total thickness) to roughly echo the scale of an annual growth ring in the tree. Working further with the idea of the span of an annual growth ring, I also limited how much of the form of the tree we would build by putting a working deadline for the project at one year. If we had no deadline, we could spend decades following every branch as it splits and continues in hundreds of directions. I like to imagine fitting the finished sculpture over the living tree today, when it might barely fit, relative to a couple of years from now, when the tree will have outgrown the form of the sculpture. Tell us about the process of building Middle Fork. I wanted the project to be a means of engaging anyone who had interest in participating in making it ­– literally people walking in off the street – not just artists. The assembly process needed to be simple enough for people with limited skill, yet complex and compelling enough to keep more skilled people interested – or a lure for people to hone skill by working on the project for a long time. My assistants led and organized the volunteers but each person that participated chose how they thought the form should echo the molds we produced (cast directly from the tree). 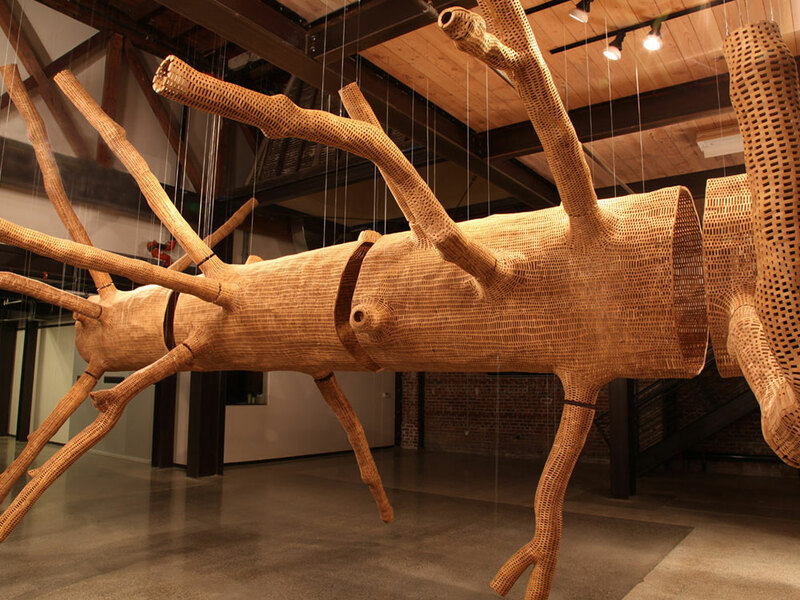 People custom cut and scaled each piece of wood and decided how the overlapping joints would flow together or apart. When you look closely at the sculpture, you begin to see some odd choices – disparate choices – and I think it is what is most interesting about the project. I anticipated there would be a few people who were so unskilled that they would make too big a mess out of the section they were working on, so I set up a special branch of failure in the corner. My plan was to gently lead the floundering person over to this branch when needed. Curiously, we never led anyone to that branch. Hundreds of people helped construct the sculpture. How do you think these different perspectives informed the final outcome? There is a shift from a wide view, where the work almost looks as though it may have been CNC cut or digitally plotted, to an intimate view, where there is great irregularity and evidence of decision-making. Middle Fork allows the viewer to see a tree – something we’re all familiar with – in a completely new way. As you’ve developed the idea and eventually the sculpture and exhibition, how has this shift in perspective contributed to your experience? How do you hope it will contribute to the experience of visitors to the exhibition? I think I pay closer attention to dead trees now. I am more drawn to a burn. The shape of trees petrified in a long ago lava flow. I am more curious about the afterlife of a tree. I hope that for viewers, the sculpture might open thought about what it means to make something collectively rather than as an individual. I am currently working on a related but much smaller sculpture derived from a tree that I cast 250 miles north of the northern tree line limit in arctic Alaska (very close to the Arctic Ocean). This tree is roughly the same age as the tree we cast for Middle Fork, but only about nine feet tall. I made the cast alone and will build the sculpture alone. The two sculptures will be exhibited side by side at the Smithsonian's Renwick Gallery this fall – opening in November – and I hope the juxtaposition might be illuminating. I highly doubt that what I make by myself will be as compelling as what a group of a couple hundred of us have created together. When Middle Fork closes, you’ll return the sculpture to the base of the tree where it will decay back into nature. Why? I find it more interesting to see what might come from letting the sculpture go into an entropic environment rather than clinging to preservation. Each time I put a work out into an unprotected place – the desert, under the sea, the mountains, into arctic ice – things do not go as I have anticipated. I expect to find new inspiration.